I am not sure what is going to type out of me today. I feel compelled to pass on some thoughts that occurred to me. This morning as I was resting quietly with my baby girl in my arms my mind was drifting from one thought to another. As usual, they were of a mixed nature. Still, I am surprised to notice that I have what I might term judgmental thoughts. Pessimistic, or negative, as far as what I would prefer to hold in my consciousness. After all these years, I am surprised that this is the case. I have had various experiences and come to understand that everything is just One thing. As we have all heard from various religions, and yet the mainstream consciousness is that there is all this separateness. I look at this, I look at that, I feel this, I feel that. I think of some future time, or of the past. It is interesting this experience. Of one thing looking at itself and saying it is ugly, and really feeling a sense of disgust. Or anger. Or any of the various "experiences" of separation and disconnect that seems to be one of the main purposes of the human drama. I have been working very, very diligently for many years to clear these things. Mainly because I discovered that they don't serve me well. I don't care for the feelings, and then after holding them the consequent experiences. As our friend Wayne Cho, (www.loveworldrun.com) the man who is running around the world told us in our first conversation, that he felt that the one thing that leads to the greatest peace is to discover no one is better or worse than anyone else. I realized this some 30 years ago, early in my recovery process. It came to me as many people suffer from being "ego maniacs with inferiority complexes". We feel somehow less, so we tear other people down in order to make ourselves feel better, but in doing so, because we really know what we are doing, we feel worse about ourselves. This, I think, is why drugs and alcohol are such a prevalent "solution" for many. An attempt to blot out the feelings of this perpetual conundrum. This morning, as I lay there, it came to me again that "conscious deep breathing" seems to be the only solution. If a person could rid themselves of "negative", and self effacing activities, I should have accomplished it by now. God knows I have been dedicated and sincere. But still my thoughts are polluted. No matter how much meditation, study, research, prayer I do - I am still so far off the mark. I want to live in total peace. I want to see God, Love, the One in all around me. Only pleasure at the glory of this magnificent creation and experience. The only person I know that appears to operate from this space is Desmond Green. And I have brought him very close into my life. I am going to continue to focus on Conscious Deep Breathing. It has accomplished so much, in the face of very challenging experiences. I feel less inclined to react, to defend, to criticize. But I still have a long ways to go. I know judging myself is part of the problem. I am attempting to just be aware and eliminate those things that cause me duress. I know I can trust my heart to show me the way, even though the path in this world has made me look like I am crazy, or uncaring, or a "bad dad". God knows that I have always done the best I can, truthfully. And, I feel as I continue to trust this process as being exactly the way it is supposed to be, it keeps getting more interesting, joyful, and peaceful. But no thought solution is going to get me to my desired destination. It seems that the waters of the "thoughtmosphere" are just too polluted. The other day I thought about "atmosphere", which is what science has told us is all around us (root word atom). Then we have this idea of "thought-mo-sphere", our collective reality created by a swirling ether filled with thoughts - maybe similar to cyberspace. Now I have come to "breath-o-sphere" - the one movement, of the ONE, creating the vast array of energetic experiences, senses, thoughts and feelings that we are here partaking of. It's very nature proves that it does know what it is doing. How else could all of this be held together, so perfectly, so real. So, as Desmond has brought to me, I will continue to focus my attention on trusting my breath, enjoying the show, and projecting my best intentioned "breaths" into my creations, beginning in this now moment, simply by appreciating and paying attention to my breath. This is my creation, my life, and I intend to contribute the very best, loving, peaceful and abundant thoughts, feelings, words and actions fueled by the Source breath that is moving in and out of me, now, one conscious deep breath at a time. Based on the increasing clarity, and awareness that I have been experiencing just over the past few months, it is evident that a new program is riding on my breath, to give me a new operating system. I am very ready because this life has sure been full of its share of challenges, which I have come to appreciate greatly because I wouldn't be right where I am, if it weren't for everything playing out just the way it did. Working with Desmond Green over the past five years, and being introduced to “conscious deep breathing”, I am left at the conclusion that “thoughts”, disconnected from Source Awareness, has created this amazing, but kind of, crazy world. The “reality” that we live in actually goes against, in many ways, the principle of “Reverence for Life”, or the “Golden Way” as stated by Jesus “do unto others as you would have done unto you”. In truth, it is not possible to have ONE contradict ONE, and yet all around our human experience we have people killing people, suffering and disease in many forms. Thinking has created this illusory reality. It cannot solve it. What can solve it is the One Action, the breath. It is very simple. It is not a thought based solution, it is mechanical. Notice your breath. Appreciate your breath. Come to Know that your breath supplies you with the fuel by which your human experience comes to be. If you want to test this theory, I invite you to do a very simple exercise. Stop breathing! Now, we have been living and creating a reality that is disconnected – or shallow breathing. Breathing taken for granted. Breathing not appreciated. Creating in a sort of asphyxiated state – our brains have not been getting enough oxygen to operate properly. This is because we were constructed with an autonomic breathing function (as compared to our dolphin and whale cousins who must consciously breath to stay alive). Because of this we have become disconnected, consciously to our Source Love. But now, this time that we are in, that some call ascension, or the “second coming of Christ”, is really just the process of us becoming aware of the One Movement, the Source of our Life, the Yin and Yang – Our Breath. And this awareness awakens into each person, by them discovering their own breath, and centering in that knowing, staying in each Now Moment of each breath to be-come the creator of all of our individual life experiences. This is a very long winded summation, to a very simple idea – that you can, trust your breath, because it does know what it is doing, because it is all that is going on, whether you believe it or not. Trust Your Breath, because it is sourced from the One Infinite Source of all of life and we are now awakening to this knowing. Without further ado, I now share an essay that has been piecing itself together over the last year. Part of the process, via my life experience, that has led me to the place of Knowing and Trusting my Breath, and Love as the only thing that really matters. It has been about 13 years since my original experience about Self Love. So much water has gone under the bridge, but the truth of that experience still resonates. Now coming into the picture is where this peace, this love can be found. Where can we tap into this source of love? This morning I woke up with this clarity, this knowing that we are showing ourselves just exactly where our “issue” areas are – they actually tend to dominate our personality. How can we find these things that are holding us away from the love that we are afraid we aren´t receiving? Simply by looking at our behaviors and reactions. Wherever we find ourselves slipping into any form of fear or anger, these are the places where we need to look. What we will discover is a small child, ourselves, metaphorically huddled in a corner feeling it is not loved. This is the person that we need to find, and address and assure that there is really no truth to this feeling that we are not loved. And we need to address this issue on more than just an intellectual basis, it must also occur on the level of “feelings”. This is because feelings are the basis for the re-creation of the world. And how this happens is one person at a time. Let us revisit this idea of our greatest fears. In the world there has been a multiplicity of fears that have been manifested, but what is likely the first fear. Is it the fear of dying? Likely not because we all must face that fear, it is inevitable. In my searching for this ultimate fear, I have arrived at the point that we really fear not being loved by our creator, Source, God or the One (whatever your particular belief presence). Now likely, in this life our parents become a sort of God, but if we maturely examine this we will realize that any human love is fallible and ultimately not something to expect complete fulfillment from. Thus, we must look behind all human love at the source – go to a place of examining the unconditional love that supports all life. Upon examination or contemplation we will realize the most important love we must rectify. Why would we have lost this “knowing” of the love that created and supports us? This I am not fully understanding, but I suspect it has to do with the great forgetting. The One had to forget itself in order to experience something new. In fact, any inkling of the knowing of our true nature as being made of “God Stuff” would have skewed the experiment. It appears from my life experiences that a complete disconnect has been required in order for us to fulfill the opportunity to expand the conscious experience. There are various theories about how the veil of forgetting, or of separation has occurred such as genetic manipulation or an energy barrier that has been created, but it is not in truth important to go into this as to create another layer of confusion. What will be most important is to use our human faculties to consider this. To use our mental and emotional capabilities to examine the question at hand – that is – are we loved by our creator? And secondly, how can we know this and then experience this love at a level that will eliminate the source of all fears in our life and in our consciousness? Louise Hay is one who discovered this with her healing works. In her movie, You Can Heal Your Life she tells about how she, after many years of work with various people and their dis-eases, discovered a great and simple truth – that if she got to “self love”, then all of the other “symptoms” that people were exhibiting, in whatever form, just went away. their empowering or disempowering effects. So let us look at this question of Source love. Where can we find “tangible” evidence of this love? Well, quite simply everywhere. Love, as the world and cosmos has been created is the motivating factor. It is what supports all that we experience whether it be our 5 sense perceptions, our thoughts or emotions. It is really what makes every form become and be sustained. So where can we find evidence? Again, everywhere. Now in our human form we have come to believe in a whole bunch of other ideas, but the truth is that it is the Law that holds all together. (Law might be defined as the principle by which all is held together in form, whether by gravity, attraction or any force that will ultimately defy explanation in words or thoughts, if you don’t believe me, look at science, has it reached a conclusion?) But, if you have difficulty finding evidence then go to the natural world. What other than love could hold all of this together in perfect balance and harmony (I would now add – The Breath, 12/23/2012). The truth is that every molecule is being contained within a system so balanced, so perfect that as to be incomprehensible to the human mind. The fact of the matter is though, if it were not the case, if one single molecule were to somehow “fall out” of the Divine cosmic law of love, the entire system would begin to falter and ultimately collapse. As you can see, everything is still here. So, trust that the Law of One – labeled as Love is maintaining all the plants animals, chemistry, cosmic body movements, etc. etc. into infinity. This love also holds you together, whether you believe it or not. What is so awesome about this experience here as human, is that you have had the opportunity to “test create” something that was outside of this – in your own consciousness. You have had a chance to discover what it might be like to exist outside of what is really going on which has allowed for a whole new set of experiences to be cataloged. But the veil of forgetting is rapidly being lifted. The show is closing and the time for processing, in the human form is coming to pass. Soon, all will be discovering there is a new pattern, a new substance to your experience as the Spirit of Love re-emerges into the very fabric of your being, that you describe as your DNA, molecular, cellular, energetic or whatever term you might assign. But it is key that you consider this with you current human faculties. I would likely call this processing or contemplation. We need to take the time to make sense of this in our human form. Bring home to our human consciousness, both intellectually but even more importantly emotionally as to gather the most from this fantastic experiment, experience. More explanation of the source of this creation. All creations from Source, Goddess, God, the One come from love. But in order for the One to experience something other, it was first necessary to create “Free Will”, this information is brought to us with clarity from the Law of One series, as channeled from Ra by the L/L Research group in 1981, but if one deliberately examines all the teachings behind the great religions (before their dilution with other information) you will discover this foundation. The creator of this multi-verse creates everything with Love - as we also recognize most definitively when we humans create babies. But only love, cannot experience itself if there isn´t something other. So a complete forgetting had to occur. This was the purpose of Free Will – which manifested duality, expressed in the two forms “service to self” and “service to others” (Law of One, L/L Research 1981). Now, to assure that there was no confusion in the matter, the One´s second act after implementing Free Will imposed “Love” again upon the creation. This was further assurance, or a back-up strategy, to assure that no matter how the experiment in this creation went, that there would be nothing that, ultimately, could be created or experienced out of love. So, for our intents and purposes, and for our understanding of this, at the most basic levels we have three important steps. 3. Love, as a rule was imposed on both paths of free will to further assure that the balance of the mult-verse be sustained upon the basis of the original motivating creative impetus – only Love. Now, as the world approaches what everyone on the planet is aware of, such as the 2012 event, is the shift to a new consciousness, whether or not you are willing to consider or believe this is happening has no effect on the fact that something really significant is happening on Earth. Again, you are FREE to believe or do whatever you will, or discuss and argue until you are blue in the face – but no matter what you decide to believe in, know that something IS happening, as something is always happening. The forgetting is ending. The veil of consciousness is being lifted, and the Spirit of love is infiltrating your lives and all systems at multiple levels. But your physical form is a gatekeeper in many respects. In the end, this process will play out for all souls, but cooperation or open-ness to the process will greatly accelerate the process and allow for it to be much more pleasant. In other words, “resistance is futile” – in the end Love will have its way with you whether or not you agree – the key issue is how easily and comfortably do you want go along with it. If you resist, you will experience greater and greater levels of pain, suffering, strife, stress or whatever else you want to call it. In other words, you cannot resist the inevitable. Can´t you see this is how the Spirit of Love has been acting in your life all along? Love asks you to act out of love. But you believe that their something other than love, which there isn´t, but the Free Will experiment allowed for this little foray, but the jaunt in the “netherworld” is over and you are being invited, supported, welcomed back into the fold of Divine Love (which by the way you have never been out of – you just thought you were). See how powerful thoughts can be? And feelings are what the experience is about too, and they lock or create the reality in a way that can be repeated, essentially indefinitely, which has been the story of the “human condition” – pain and suffering passed on generation after generation, civilization after civilization. But this experiment has run its course, and each and every soul is being brought back into the stream of love, which is the natural progression of all of life. To return to Source Love. So how do we come about experiencing this Source Love, as to become conscious participants in this process. Well, based on the insights that I have been given, it is a matter of bringing peace into your own life, your own consciousness, your own experience. This is not about imbibing Peace from those around you, as many of you are not in a peaceful place. Now Source Love is sending peace to every molecule and atom of your world, but the power of the Human collective consciousness is very powerful. How do you think all of this experience that you have had was created? It was created by the collection of soul consciousness that are residing on your world – for lack of a better term it is like a “collective soul agreement” – a sort of contract that you each individually agreed to when you came here. In other words, you all really are in this together. But, seemingly paradoxically, the change you want to see in the world is not imposed by you on those souls that are around you, but by what you do inside of your own Self. As many of you likely have learned, you cannot make any other soul do anything. You don´t believe me?, have you ever tried to get a baby to eat when they don´t want to? This applies to everything. But, also, as many of you are realizing, if you change your internal perceptions and experiences your entire world and life can change in an instant. The examples of this are so innumerable as to be astounding. But, if you can´t find an example in your own life, which I can tell you they do exist, look to those outside of you who have demonstrated a profound shift in their lives. Examples of this even touch every family, but you also have people who demonstrated this to the whole world, and they have been recognized by duly appointed entities. To state more explicitly, you will experience Peace and Harmony when you find that Peace and Harmony in your own being. How can you find that Peace and Harmony? Well it is not so much of “finding” it as it is of just experiencing it. You can´t really find it, because it never was lost. It is the total make-up of everything – what you see, feel, sense, think, is Love and Peace. Why can´t you experience it – because you believe, in your thoughts, that something else is happening. Now this isn´t all your fault because this confusion has been accumulating inside of you through various forms as you might see as genetics, generational or familial influences, etc. But the key is, these things need to be addressed. These old beliefs, the antiquated and “anti-love” viruses or thought patterns are to be released. The truth is, it is all made of love – the pains you suffer are Love´s guidance to help you stop the suffering. But how do you find where the issues are that are not allowing you to experience peace and happiness? They are behind the feelings where you don´t feel peace and happiness. There is a belief behind your feelings of disharmony, your anger, your sadness, your lack of peace that is asking to be released. This is the power of “letting go”. The truth is, the love necessary to transmute these feelings, that you really so urgently want to let go of, is right inside of you. But the key is, you must allow yourself to FEEL it. This is the great shift that is occurring. Human beings have been trapped in a thought world, a labyrinth created by the concept of duality, which when it runs its full course results in an incredible amount of diversity, of creation. But the time has come to ground yourself more into the essence of the One´s true purpose for your Being – that is in what you call “feelings” or “emotions” (e-motion = energy in motion). Yes the One experiences its creation through all thoughts and sense perception, but the essence the real power of the experience the “value-added” so to speak is in the human emotional experience. This is why they are so profound, so spectacular, so REAL. Now many of you still don´t get the fact that your feelings are your guidance system. They are the ones showing you which way you should be going in order to attain your most profound and fulfilling experiences. Many of you still think that your feelings happen as a result of you experiences, as if imposed from the outside. They do, in a sense, but most of you are living in a type of defensive posture, taking actions not based on your own truth guidance, so are paying the price in negative experiences and emotions. If you are not creating your life and experiences deliberately and from of posture based on Love, then your experience and your life really seem like it is “happening to you” – but this is not the original design. You were given the tools to create your life positively and deliberately. And your feelings and desires are the things that have been guiding you. But, there has been a significant alteration of the Divine plan, especially in your collective experience. It is time to bring yourself in balance and take control to create your life in the fashion that contributes, and is in alignment with the original program that is deeply imbedded inside you. It is time to quit allowing the external, collective “viruses” re-program your day to day experience – which ultimately create your life. Take the time to discover the truth of what you are reading. If you have trouble getting to this in your conscious awake (which is really more asleep), then tap into the power of your sleep state. Take time, write some statements asking your higher aspects to help you while you are in your dream state, to access the original program that was built into you. A simple process would be to write out some “affirmations” or positive statements that you would like to have occur. It is good to read these a few times a day, but if nothing else, read them just before you go to sleep. Try to create the most positive, joyous and grateful atmosphere within yourself before you read the statements. Then relax for about 10 minutes, just in a quiet meditative state before falling asleep. Finally, I suggest that you add the statement “Thy will be done”, to the end of your affirmations. (Thy can refer to whatever you believe in e.g. Goddess, God, Allah, Source, One, etc.). As we go through our daily lives we can discover those things that are hindering our progress simply by paying attention to our emotional states. The times we experience what you would term “negative” emotions are the resistance we receiving from the Divine Guidance program that was put inside of us to lead us to our most spectacular realization of our Soul´s life intention. Put another way, the feelings of sadness, anger, frustration, etc. are us swimming against the flow of our own river of life. The program that was installed in us is telling us, you´re going the wrong way – STOP, or know this resistance, this “suffering” is going to increase – like a ringing bell that gets louder and louder until we notice it. If you can´t see it occurring in your own life, is there anyone around you that is experiencing this kind of thing. The easiest to observe, that are ubiquitous in nearly all places are what you call “alcoholics” – but in many respects it happens in everyone elses life around them. It is no one´s fault. Each of you are sovereign beings, and are responsible for following your own program – essentially your own heart love. How do you get to the bottom of this, how do you notice when you are going in the wrong direction? It is quite simple. Just watch for times when your emotions take a turn. If you experience a downturn or shift in your emotions, or feelings, towards what we call negative, then you can know that the results of those thoughts, spoken words or actions are going to result in some kind of learning experience. They are not bad, as all experience serves a purpose, ultimately to teach about love, and our creative powers. We can create anything, including things that “apparently” are against the Divine flow of Love. We have a choice in each moment, to choose creating harmonious experiences, or learning experiences through all of the types of things that we humans have created in our collective experience. These things include hatred, resentment, war, famine, disease, etc., etc. These experiences were our choices and we are not victims, per se, except in the way that we have constructed with our thoughts and stories that we have been telling over and over again, possibly, for an extended period of time. Emotional mine fields are what we have created in our experience that we can use as a way to direct us out of these stories. We can be observant and diligent, watching our emotional state to discover if we are going to have happy experiences, or something else. It is up to each individual to choose. Joseph Campbell said “follow your bliss”. Abraham, of Esther and Jerry Hicks gave very clear information about the emotional spectrum of feelings. Abraham provided very good instructions to guide oneself from one state of vibrational experience such as pain and suffering, to higher vibrational experiences such as joy, happiness, love, compassion. Desmond Green created the Moods Channel, which introduced such ideas as “self talk”, or “tracking” each very important tools, or skill-sets to empower an individual to transform, or alter their life experience by coming to know that we each are the masters of our own life experience. And when we learn about the way that our “operating system” was designed and we learn to navigate our moment to moment experience intentionally, then our life will dramatically change. The following are essays that I had written previously, essentially downloads, possibly from my “higher-self”. I do not “channel” per se, as I am always totally conscious when I have written these sharings. Essentially, I feel compelled to write, more often than not early in the morning or waking up in the middle of the night with an incessant urge to get ideas that are floating around my head down on paper. If we observe nature it shows us many lessons. These can be lessons for our living happily and fruitfully. All things in nature express their true nature. So what is our nature? Our nature is consciousness, thinking, feeling. This is what is meant to be made in the image and likeness of God. Our nature is to think our reality into being. This means that we create our reality. Our nature is also that of light. Of course our (physical) vibrations are lower than those that we imagine to be the light from the sun or from a light bulb – but we are of the light. But the thing that we have been conditioned to not see, as a result of our senses, which are totally mesmerizing and consumptive of our conscious attention, is that through thinking and feeling (which again is the nature of God) we can raise our vibrations. We can see this occurring in what we do with manipulating energy of various types. Through the instruments of electronics, and engineering we can amplify signals of energy to higher vibrations. This too was done through thought – someone had to first come up with the idea to do this, which followed to thought processes of making it reality. But we are thinking centers and what we have not realized, or manifested, as a collective consciousness is that we individually can amplify our own energy. This is likely the consciousness that is being beamed down upon us. Maybe it is coming from the sun, the stars, the central sun – or, in other words, from Source, the One - Inviting us to increase our vibrational frequencies to experience a more harmonious reality. It appears from observing our day to day existence that we are all desiring this. You could deduce such from the level and extent of our complaining. On the other hand you can also observe that we really don’t want a new reality. This is because we appear to not be willing to change. If we really wanted a new experience then we would take the steps in order to remove ourselves from the systems of thinking and feeling to allow ourselves to experience what we intuitively, or from a feeling point, believe to be possible. As a metaphor, this heavy, or slow vibrational reality is like quicksand. And we are like the man who is struggling to get out, making all kinds of noise and commotion, but as the hand or rope is extended to us we are unwilling to grasp them in order to extract ourselves from the sinking condition. The hand or rope, in this metaphor, I see as the ancient teachings of the great and wise ones, and as the clear and simple messages streaming in from other places (probably too our own hearts). Many years ago I imagined God as having many radio stations that are broadcasting messages for rescuing myself from my various conundrums. I would talk to other people about not growing any new antennae, so the capabilities must have already existed within me. I just needed to become receptive. Given what I feel is happening now, the number of channels have increased significantly. The key is to not get distracted by the fragmentation reality. That being the aspect of existence that is based on the idea that there isn’t enough to go around. That perspective is limited to cutting the pie into smaller pieces. This paradigmatic view seems to be the prevailing perspective in human consciousness, but as I observe the greater reality (which are mirrored to me in nature and the cosmos) the “real reality” is one of expanding possibilities. In other words multiplicative in nature. The purpose of the contracting, or minimizing view appears to be to get us to turn around – as in Plato’s cave. All of the experiences which we seem to be so abhorrent of (pain, suffering, tragedy) all have lessons in them, and physical revulsion (sickness, disease, etc.) that are literally pushing us to go toward the Truth – that truth, at least in the “light creation” that there is only love. There is no selection process in life for there is only love. All suffering, despair, tragedy is God’s message to return love, to return to love. The truth is, is there is only love, we just think there is something different. This is just how powerful we are to create something from love that we believe not to be. But the real lesson in all of this is to be in the love, share the love, know the love. All comes from love and will return to love. I will love all until I die. All That Is is perfect. All that is expected is to move the vibration of our life, and our collective experience to higher vibrations towards what we think is light – even though we are really made of light. Yes light is intelligent (fiber optics) but light carries DNA and life forms too. We are light, and light is the perfect expression of love – it is Good – it is God’s gift to us – and it continues to be poured down upon us in such abundance that we cannot comprehend the extent because it is infinite. But that is not the point. Of course we can measure, but we probably don’t want to get lost in measuring (this is where I started laughing because this is what we are doing on this planet – counting and measuring “not enough to go around”), the point is we are just supposed to enjoy the process and be grateful for the experience. It is not limited – the illusion is having to proportion out – to measure. We have gotten lost in measuring. There is so much light coming from our own sun that we don’t use. I am happy. I am so grateful for illumination. I see the light. I love the light. I am the light so my most basic program is to love. It is the starting point of my existence so I need only invite, allow that program to reassert itself into all that I do. Thank you Goddess/God, Source, One Love! Here is the message I recorded this morning July 14, 2009 at 4 am. I have not edited this at all - including apparent mistakes. - When you they've hurt you, love them that much more. - Judgment's purpose is the lesson of non-judgment. - I watch the love that Martha pours on Benjamin and it teaches me a small measure the capacity of love the Source has for each of us. - Orcs need love too (Orcs from Lord of the Rings by J.R.R. Tolkein). - I feel your pain. I am your pain. but each is relative to the student. all and those who don't know or believe I love, I love that much more because love is what brings you and them to me. - I love you, for you are why I exist. I became so I could know you - each of you – each of what I am, a blade of grass, a living soul is precious to be beyond measure in human consciousness. - That is my very nature all that exists within me is infinite externally, including my love for each particle of my existence. - My conscious, free-will portion of me has a very special place because that is the part that can come to recognize and experience this - but not by my force or charge - maybe from my coaxing. This last part I recorded this morning after my meditation, as I remembered the thoughts as I fell back to sleep last night. - I have never earnestly and honestly sought God, or Source, or understanding and not received it. The key was that I believe that I was open to the new knowledge. I think many times people think they know and so close the new understanding to flow in. I have discovered that what Solomon said to be true, that there is nothing new. But sometimes it appears to be hard to find. Life is really about us working out our relationship with ourselves. Is she the One? (the ultimate question from the movie the Hitchhikers Guide to the Galaxy), or (Am I the One). A part of us knows that everything is the one but this world seems to be a testing ground for how far will love go and still love. The "issue" in process is just me rectifying the issues between my prior perceptions that there are things other than me, my coming out of this program which has been emotionally ingrained, habituated. If I accept that there is only one thing here, then why do I have all of these issues with myself? At first I cannot discover this by watching others, but after I come to realize the issues are really in me, then the evidence is incontrovertible - it's in my face. All I have to do is realize that each time I find myself emotionally charged (typically negative) I am confronting an old program that is attached to my old perceptions of things being outside (separate) of me. It boils down to me rectifying my perceptions of my relationship to the One. Why would One punish Oneself? Love doesn't punish, so at those places that I discover conflict or experience pain it is actually a "learning point". When I discover a learning point what happens, or how I deal with it, demonstrates going to the Truth or some other reality, some segmented part of the One. The Kingdom of God is Within Me comes from becoming absolutely clear intellectually and emotionally with all the other parts of the One - to love it. It is either the way I want it, or it has a lesson for me for my growth. If I am experiencing negative emotions it is either contradictory to my greater good or it is triggering a dysfunctional part of my prior programming. All evidence points to the truth. All evidence points to the truth there is only One. However, it has divided itself into many aspects/parts. Why would One thing punish itself? To experience something other than One-ness. It wouldn't really punish itself because it really serves no purpose because it already knows. So the purpose is to create many different parts, let them forget, and then discover, or go back to that knowing. The thing about earth is the density, the intensity of the experience and the number of possible divergences, dead-ends, or detours is innumerable. However the choice really comes down to a simple one - am I choosing the true path or something else? And the true path is illumined by Love. Why would I abuse myself if I knew the Truth? I wouldn't. So why do I abuse myself and others? Because I don't understand. I don't realize the truth. I should not punish myself, the pain and suffering is Love guiding me toward it. It is my job to determine at any moment whether I am making the right choice or not. It comes down to a very simple "either, or" choice. The truth (love), or not. And if I am clear about my emotional conditioning, if I have done the work to examine the familial and cultural programming that choice will become simpler and simpler over time. The challenge is not to fall into another "program" that creates another intellectual or emotional cul-de-sac. A friend posted a message on Facebook about the shootings. I felt compelled to share, again. This is what I wrote. I am sure that this post will get some discussion, but I have to share. I will not get in any arguments, just have to pour out my heart, as you did Monica and I thank you for your all important questions. I have sought answers for more than 30 years and as Jesus said "Ask you shall be given, seek and ye shall find, knock and it will be opened unto you". The following is just part of what I have found. All that happens is in God, and when we find this God in ourselves, these experiences will fall away. God is everything, or God is nothing. What does that mean? "The father and I are ONE". "If you believe what I say, you will do all I do, and more! ", because"it is the father that works through me". Was Jesus joking? Nothing can exist outside of One Infinite Creator (God if you prefer). If it is infinite, there can be only ONE. There is no separation. There is no death. Does God die? We have created these traumatic experiences, simply as a reminder, to wake us up, so that we can now create paradise on earth. There is so much evidence, now experiential of people coming back after dying and saying it is amazing, leaving these bodies is like leaving prison. But, we came here to live, to love, to do something beautiful. All this pain, suffering, disease, war, famine are simply a re-creation, a playing out again of Jesus dying on the cross. This pain motivates to stop being so ignorant, blind, selfish and do something and see God in everything, every body. When we know this we will not even imagine lying, stealing, killing. There was a choice created by the One Infinite Creator so it could experience something different. Free Will - 2 paths, Service to Self, Service to Others. It is US who is making this world. Everything you say Monica is true, but we have to get to the first cause and that is the belief that we could somehow be left out of God's love. It is not possible. But if we "believe" it to be so, that is the experience we are creating for ourselves. That is what it means to be a co-creator, to be made in the image and likeness of God. Here is something I wrote that speaks of this love, that I know, because there is absolutely no other way for all of this to be http://13lightmessages.blogspot.com/2010/10/love-transcends_31.html - the way we can get back to this knowing is not through our reasoning mind, through thought, because this has been so poisoned, confused, controlled, like Einstein said "you can't solve the problems with the thinking that created them". The solution is through the action of our breathing which connects us to the love of God/Source/All That Is. God, I believe, is uploading the new consciousness to us through our breath, it will awaken in you the One-ness, the nurturing of the feminine, the Reverence for Life. It will teach you the truth of what Jesus said, "do unto others, as you would have done to you" - which means, simply, what you do to others you do to yourself, and to God, because You, God and Jesus are One - they are in your heart, but you must find the kingdom of heaven inside of you. But guess what?, you are here now, and the God, of Infinite Love is supporting you, totally, whether you believe it or not. A few nights back (Dec. 13) I had a very vivid dream. I was driving a bus. I vaguely recall that there were other buses with me as we were traveling down the road at a high rate of speed. I remember that we were traveling about 70-75 miles per hour. I was in a pretty intense state because the most curious thing was that we were traveling backwards. I was amazed as I sat in the drivers seat observing what I would normally not be able to see, directly behind the bus (I have driven school and charter buses since 1979). I was especially astounded as the bus stayed in its lane perfectly. I was concerned, but also felt a level of, "oh, I guess I have to just trust, because we are staying in our lane perfectly". There were other cars but I did not really take much notice. Then another worry entered my mind. What am I going to do if I have to stop? Not long after this I found out. I hit the brakes and the bus just swirled around on the highway, perfectly in the lane I was in, and came to a stop at a stop light. I don't remember any more after that. I don't know if I woke up, or what. But I have since been sharing the experience with others because it seems to be a profound metaphor, possibly a prediction of what is coming to be, or already is. The first person I told this dream to was Desmond Green. He found it to be a very profound declaration, of sorts. A beautiful omen, or forecast. It feels that way to me. I had written and spoken a great deal about "the upside down world", and "turning this bus around", but I had never had such a powerful dream experience. Another metaphor that I have used many times is that we have been living our lives similar to driving our car by looking in the rear-view mirror (all the emphasis in the collective about history, old stories, etc.) What my interpretation says is that this has been our experience as a collective. We have been living blind to the truth of where we are going, and that we can trust God/Source/All That Is because it truly is driving the bus. In our not seeing down the road we have experienced all kinds of fears, but the bus is on track. We just have to trust. Now, the bus is turned around and we can see out of the windshield and we can drive with a clear view. 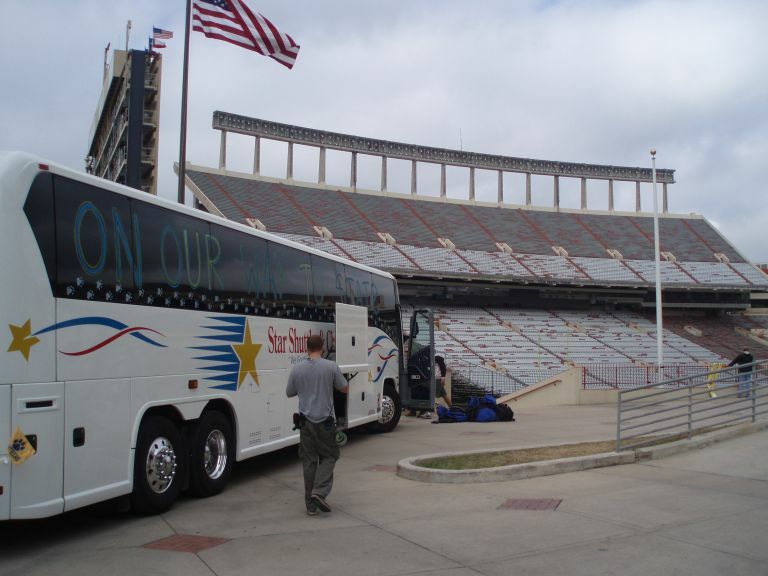 picture is from when I drove a charter bus and got on national TV for the show "Friday Night Lights". It was the season finale for 2009, Underdogs. I didn't get to see if I really got on until 2012, from Net Flix. There is more to this theme of sand, glass, crystal, music, harmonics, co-evolution between carbon and silicon that I might share about. There has been this ongoing theme stemming from as far back as my teen years, but I may wait to write about later. Or, I may not. What I do know is that we are waking up, because I am waking up to a much greater Awareness. It really connects, and validates an experience I had over 30 years ago Thirty Years to Tell this Story, and then another mind-expanding experience My Burning Bush.